Regular seeds means that both male and female plants can be found in a packet of seeds. Male plants are needed to take a strain to a next generation by improving and/or stabilizing genetics. Sanniesshop, unlike many other seed banks, still sells regular cannabis seeds because in our opinion it is necessary to use regular seeds in order to make selections and to find that winning plants to make seeds with. Feminized seeds are less suitable for this purpose and are solely meant to harvest weed from without the goal of creating future generations. Fast and secure! Any strain is recommended here! Keep up the great work. Second Order and i am very happy. Take 3 Days to Germany! Thanks alot Sanny and Co! Fast shipping, healthy looking beans, great communication. Thank you Sannie! The cannabis plants all have male and female chromosomes which means that both male and female genes are present, this is a natural mechanism for the marijuana plant to ensure offspring even if there are no male plants around. In a natural environment both males and females are present, so that in the course of the flowering period flowers will be pollinated and seeds can be made. These seeds are regular seeds which ensures that the following season there will be sufficient male and female plants again to continue the cycle. 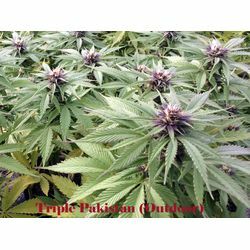 The worldwide cannabis market has grown accustomed to growing with feminized seeds since that way the grower will be assured of only female plants which of course makes life easier and that is fine! On the other hand, we have a responsibility to supply the highest quality cannabis seeds, and therefore we need regular cannabis seeds. By making selections with regular plants, the winning plants are sorted out to create the next generation of regular seeds or feminized seeds. To bring our regular strains to a next generation, we cross the selected male and female as clones. The pollination takes place with 1 pheno type female and 1 pheno type male. By repeating this over the years and making the right selections, the strains become more and more stable and further into the generations (also referred to as F1 F2 F3 etc.) more winning plants can be found in a bag of seeds. .
On average about 50% will be male and can be removed if no seed production is required, the rest of your plants will fill your space perfectly. The remaining plants are regular females and can be used for all purposes. Regular plants are stronger and if you found a winner you can also use it to make your own seeds. To the real enthusiasts creating seeds is the ultimate challenge in their hobby which they can really put their thought into. Mother nature is our teacher !